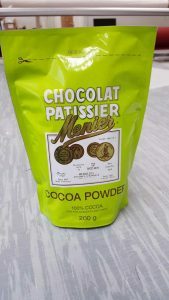 Our versatile Chocolat Patissier Cocoa Powder is rich and luxurious, made from 100% cocoa. Add to your baking to give it a deep chocolate taste and velvet texture to your cakes and swirl it into hot milk to make a decadent hot chocolate. Our powder is ideal for adding some finishing touches to your creations, just a fine dusting to the top of your cake will give it a professional feel. Our cocoa powder is UTZ certified which means our cocoa is grown sustainably with care for the people, product and the environment.